This afternoon, the controversial classification of a 28-page finding on foreign government support of the 9/11 hijackers received some long-overdue scrutiny by a major news network, as CNN’s Jake Tapper examined President Obama’s failure to keep his promise to declassify the material. ODNI refers to the Office of the Director of National Intelligence. One wonders why an administration that promised to bring a new level of transparency to the federal government wouldn’t have volunteered that information earlier, particularly when letters to the president from 9/11 family members and survivors are going completely unacknowledged. 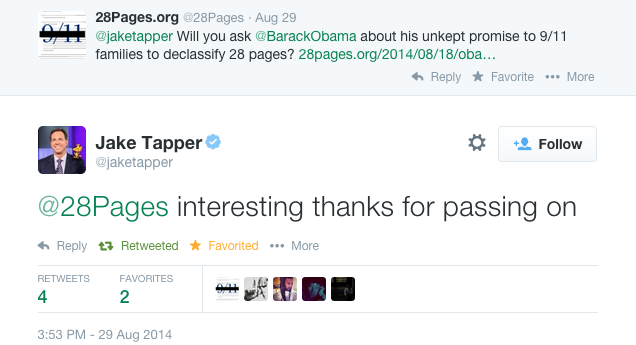 Tapper’s report is well worth your time, and includes interviews with H.Res.428 sponsor Rep. Walter Jones, former Senator Bob Graham, 9/11 Commission Chair Tom Kean and Bill Doyle, who lost a son in the attack and was the personal recipient of an Obama assurance that the 28 pages would be declassified.